Your great grandfather didn’t pay $5 for a razor blade. And you don’t need to either. These are ten of the sharpest, smoothest shaving blades in the world. They’re used for wet-shaving with a double-edge safety razor and are made from the finest Japanese steel. Each blade costs about $0.60. Not only are these about 1/8th of the price of Fusion blades, you’ve probably never seen them before because almost no US stores sell them. 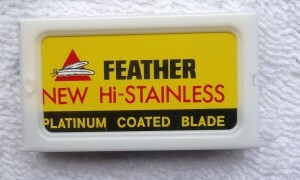 This razor is generally cheap or free because the blades are almost $5.00 each! Yes it has five blades, and no, that’s not good for anything except advertising. Barbers use a straight razor and give the best shaves in the world. Two or three or four or five blades in a cartridge is just a gimmick designed to make you think that shaving is supposed to cost $5-$10/week. 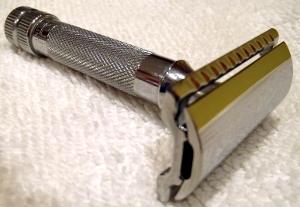 Blades for the razor above will cost you about $0.60 for a week. the five-blade cartridge costs almost $5. If you use a blade a week, you’ll have an extra $228/year! Your grandfather was a smart guy!